Yesterday I was feeling really bad (emphasis on really and bad) and I really didn’t want to get out of bed but I didn’t want to miss another art lesson either. So I went and I painted badly. It’s hard to paint when you’re in pain. Then, later after I had taken some more pain medicine and was feeling a bit better I got my paints out again. I looked through my pictures I took when I went to Chena Hot Springs with my husband for our 20th Anniversary. 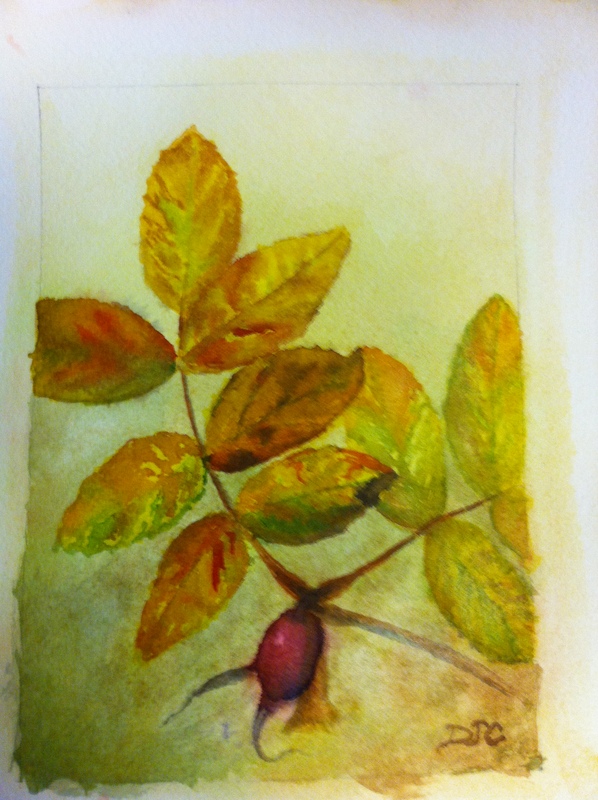 I took a lot of pictures of fall leaves so I could paint them later. When I finally looked up at the clock again it was 5 am! So I went to sleep for a while and then after I woke up I added some finishing touches. I love fall leaves. The colors are so beautiful and rich! I just want the world to stay those colors forever but here in Alaska we only have about 2 weeks before it’s all brown and on the ground waiting to be covered up by snow. Here is my painting… Not the best but I will most likely paint many more pictures like this until I get better at making the paint do what I want. This is watercolor and I love working with it. I get the neatest effects… sometimes it works like I want it to and other times it sticks out it’s tongue at me and says “na-na-na-na-na”. I am learning a lot during my lessons and also from watching other people. I joined the Fairbanks Watercolor society and they have meetings where they teach various things. I’ve only been to two meetings so far and I’ve had a lot of fun. I’m also learning about Art Journals. I love this idea. I always like quotes or poetry, either to spark an idea or I actually add them to a picture, especially in my sketch book. So I bought a sketch books especially for that purpose. In that book I can use pencils or paint or collage with neat little scraps of things I’ve collected. It’s a cool idea. I have a friend who is going to teach me more about this and I can’t wait!